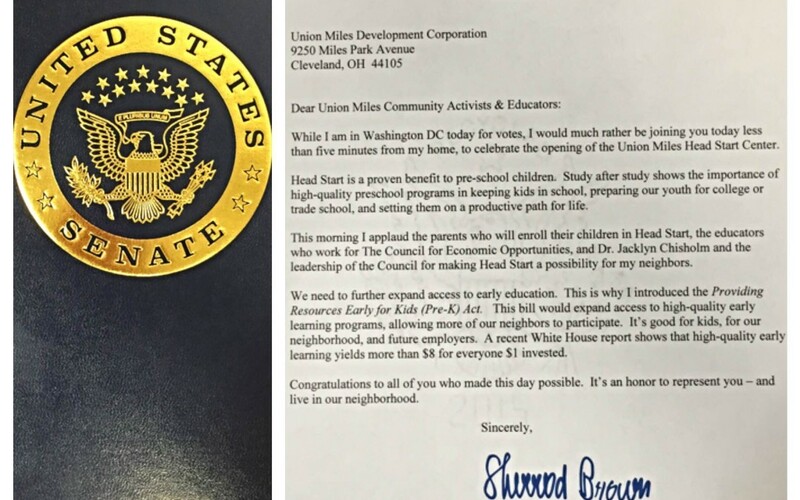 Senator Sherrod Brown (D-OH) congratulated the Council for Economic Opportunities, as a new Head Start center opened in the Union Miles Development Corporation on Tuesday. At the open house welcoming ceremony, Sue Klein, executive assistant and Project Director from Sen. Brown’s Cleveland office, read a letter on the senator’s behalf. Sen. Brown referenced the benefits of high-quality preschool programs, and talked about what he’s doing on Capitol Hill to make preschool programs more accessible across the country. While I am in Washington DC today for votes, I would much rather be joining you today less than five minutes from my home, to celebrate the opening of the Union Miles Head Start Center. Head Start is a proven benefit to pre-school children. Study after study shows the importance of high-quality preschool programs in keeping kids in school, preparing our youth for college or trade school, and setting them on a productive path for life. This morning I applaud the parents who will enroll their children in Head Start, the educators who work for The Council for Economic Opportunities, and Dr. Jacklyn Chisholm and the leadership of the Council for making Head Start a possibility for my neighbors. We need to further expand access to early education. This is why I introduced the Providing Resources Early for Kids (Pre-K) Act. This bill would expand access to high-quality early learning programs, allowing more of our neighbors to participate. It’s good for kids, for our neighborhood, and future employers. A recent White House report shows that high-quality early learning yields more than $8 for every $1 invested. Congratulations to all of you who made this day possible. It’s an honor to represent you – and live in our neighborhood.